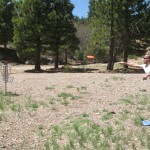 Although we haven’t gotten a lot of good beach weather yet this summer, the local disc golf courses are in great condition and playing well. Over the last couple weeks I’ve played Truckee, Tahoe Vista, and Bijou in South Lake. 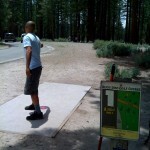 Tahoe Vista is definitely the most challenging course, its plays long, has a bunch of uphill putt and approach shots, and has a lot of underbrush to lose discs in. 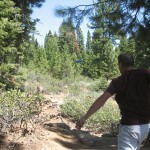 Truckee is a little more open, but still has some challenging shots and plenty of underbrush. This past week was my first time playing Bijou and I was very impressed. Its a bit of a drive for those of us on the north shore but is very conveniently located for anyone in South Lake Tahoe. It has a full 27 holes, and much less elevation change and underbrush than either Tahoe Vista or Truckee. The first nine holes are relatively short and open, perfect for beginners. The course gradually gets longer and more challenging as it goes along, with the last nine holes being the most challenging and the most scenic. After playing Tahoe Vista, the lack of underbrush was a nice change, it makes errant shots much easier to find which is a huge bonus for a player like me. As far as gear goes, I’m loving the Innova Beast Champion Driver and Coyote Midrange. For a stylish way to carry your discs on the course, look for TMS staff carrying the new Double NutSac disc bag out on the course! John getting ready to tee off on the first hole at Bijou.